A new year brings a sense of possibility—and it’s not just for making goals for your personal and professional life. 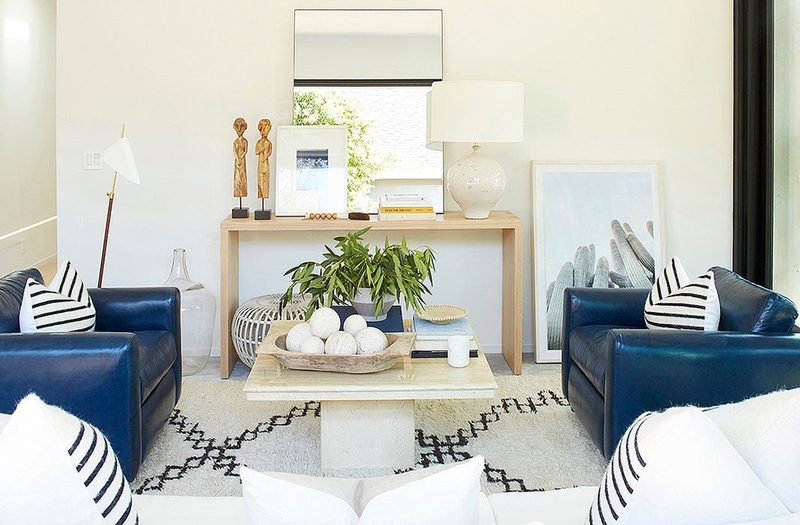 January is the perfect time to turn your attention to your home, whether that means trying out a new trend for 2019 or just getting around to accomplishing the projects that you’ve been putting off. After all, your calendar isn’t as full as it was during the holiday season and a chill in the air might be keeping you inside anyway. (Plus, refreshing your surroundings might inspire you to keep up with your new resolutions.) So, put that time and beginning-of-the-year motivation to good use with these five ideas for updating your home for the new year. 1. Out with the old, make room for the new. Join everyone else on your social media feeds and embrace your inner Marie Kondo with a long-overdue declutter session. (Her new Netflix show is the perfect background noise for this project.) Though Kondo recommends starting with your closet, cleansing your kitchen will provide fast results and give you the momentum to take on a full-house decluttering. Take a page from this charming kitchen and clear all the surfaces of everything but the items that you're either use daily or give you joy. With the visual space your clear, you can afford to use playful floor tile or another eye-catching accent. 2. Incorporate “airy” décor into the bedroom. From late October through December, the “public” spaces of your home got all the attention thanks to a busy schedule of holiday gatherings. Now it’s time to indulge yourself with a bedroom decorated for maximum relaxation, like this space in Alexandra Evjan’s home. Swapping out a solid headboard for a rattan design, integrating furniture with slim legs, and adding light-colored drapes creates an open feel immediately feels soothing. 3. Try a new color. A new coat of paint is all you need to make your space feel completely different. 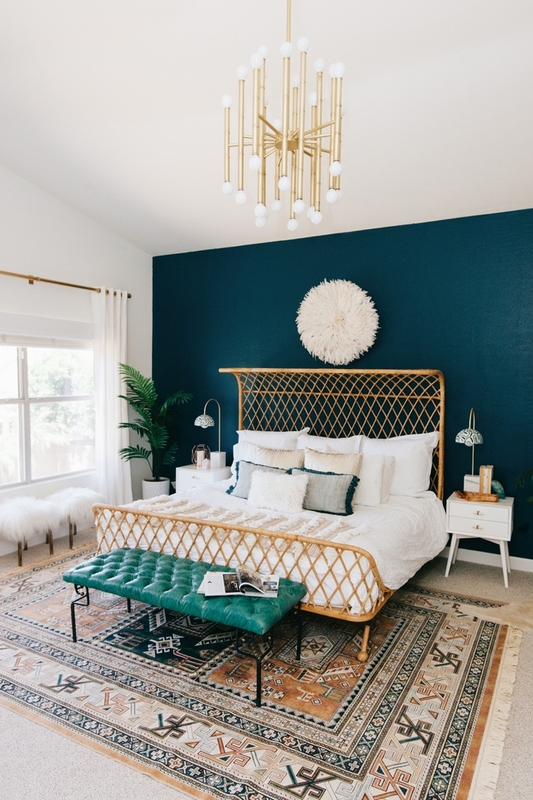 Right now, we’re seeing two big trends when it comes to paint color: Dark hues with a hint of gray, and whites with subtle undertones from warm to cool. 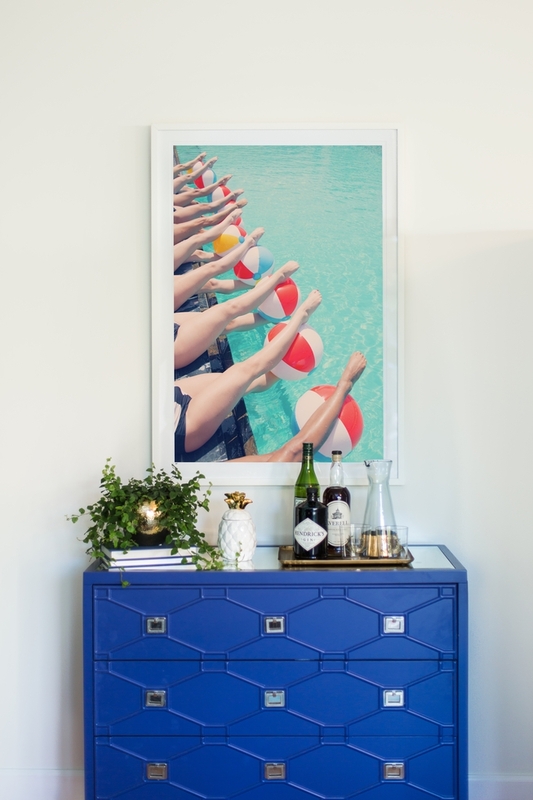 If you’re hesitant about picking up a roller, a boldly painted storage piece, like the brilliant blue dresser in the home of Gray Malin, will more than suffice. Hanging art is the quickest way to improve a view or create a focal point. 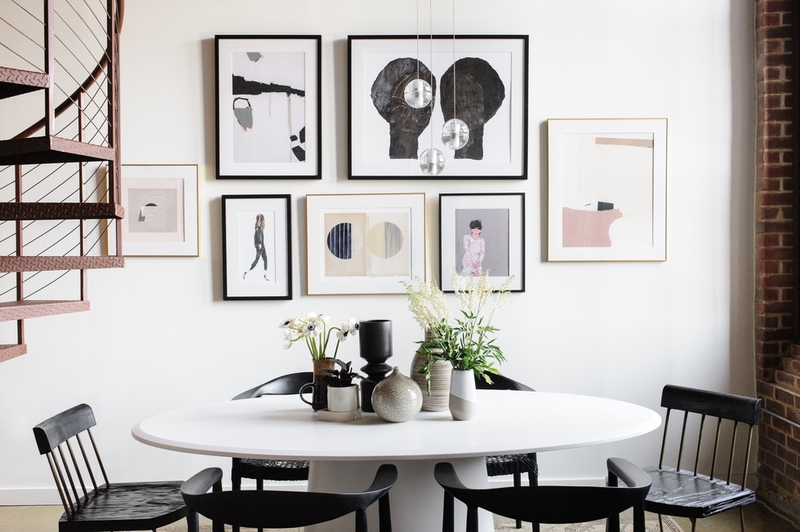 In Jamie Chung’s Atlanta apartment, a huge wall became the perfect gallery for a salon-style grouping of art. For a similar look, choose frames that have similar proportions, and group prints with a shared color palette or theme. 5. Make a statement with seating. We’re calling it: 2019 is going to be the year of the accent chair. Choosing a seat (or two) that contrasts your sofa gives your living room an up-to-date look, plus allows you to incorporate a new texture, color, or pattern into a room with ease. 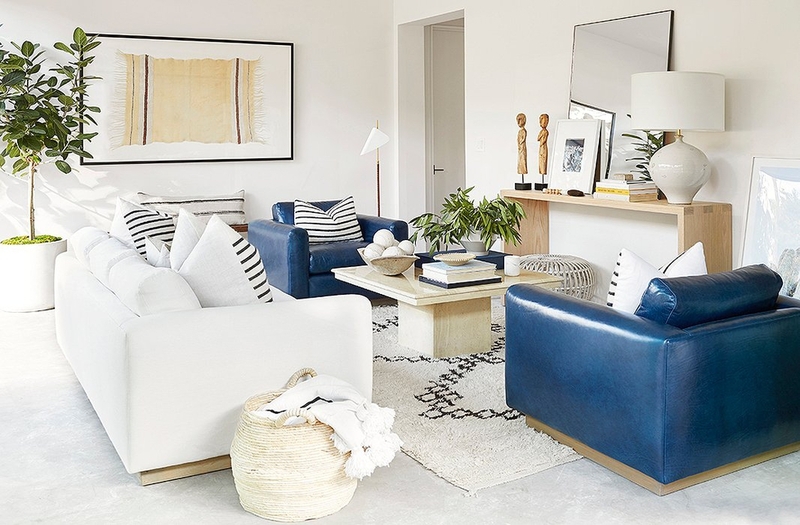 We love the way the dark blue leather-and-gold chairs add unforgettable character to the living room of Jen Atkin and Mike Rosenthal.